If he wasn’t already a poet, storyteller, BBC broadcaster, and prolific children’s book author, Michael Rosen says he would like to be an actor. Anyone who has seen him in performance knows that he already is—whether bringing his humorous verse to life in front of a classroom or presenting an internationally broadcast radio show. The charismatic author was introduced to the pleasures of language at an early age by his parents, both of them distinguished educators in London. When he was a teenager, his mother produced a British radio program that featured poetry, and this inspired him to start writing his own. 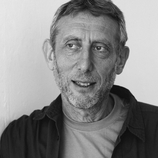 Now a highly popular children’s poet and author, Michael Rosen is known for “telling it like it is” in the ordinary language that children actually use. In Michael Rosen’s Sad Book, he explores the experience of sadness in a way that resonates with all readers, with unmitigated truth and a touch of humor. About this book, which came from the author’s real and very personal grief, Kirkus Reviews raves in a starred review, “Readers . . . will be touched by the honesty and perception here.” In the picture book This Is Our House, Michael Rosen captured the ways that children use the language of discrimination. “Our attitudes about who’s okay and who’s not okay get formed when we’re very young,” says the author, whose simple, lighthearted story makes a compelling case for tolerance. The idea that great writing comes from real people who are influenced by a certain time and place is key to the appeal of Shakespeare: His Work and His World, a delightful, engaging look at a literary icon that asks, “What’s so special about Shakespeare?” For his rich insight on the topic, Michael Rosen can again thank his parents. “When I was a kid, I was often taken to see Shakespeare’s plays, and my parents helped me get hold of what was special about Shakespeare,” he says. “I’ve written this book in hopes that I can do something along the lines of what my parents did for me.” Recently, Michael Rosen returned to the bard’s works with Shakespeare’s Romeo and Juliet. In this elegantly illustrated volume, Michael Rosen retells one of the best-loved plays of all time scene by scene in a simple, lively style that appeals both to aficionados of Shakespeare’s play and to readers discovering it for the first time. Michael Rosen lives in London.